We present the inclusive invariant mass, transverse momentum and rapidity distributions of dielectrons (e+e- pairs) in p+p interactions at 3.5GeV beam kinetic energy. In the vector meson mass region, a distinct peak corresponding to direct ω decays is reconstructed with a 2% mass resolution. The data is compared to predictions from three model calculations. Due to the large acceptance of the HADES apparatus for e+e- invariant masses above 0.2 GeV/c 2 and for transverse pair momenta p t < 1 GeV/c, acceptance corrections are, to a large extent, model independent. This allows us to extract from dielectron data for the first time at this energy the inclusive production cross-sections for light vector mesons. Inclusive production cross-sections for π0 and η mesons are also reported. 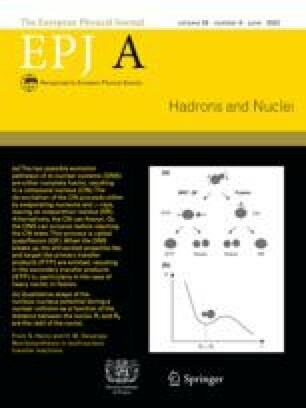 The obtained results will serve as an important reference for the study of vector meson production in proton-nucleus and heavy-ion collisions. Furthermore, using this data, an improved value for the upper bound of the branching ratio for direct η decays into the electron-positron channel is obtained.